Los Angeles authorities said yesterday that no new evidence has been uncovered in the death of Natalie Wood that would point to foul play. After several weeks of interviews and other investigative work, detectives have not uncovered any evidence the death was a homicide. Chief detective William McSweeney told the Los Angeles Times cold cases like Natalie Wood’s are never really closed and that detectives are still looking at some aspects of the case. “At this point, it is an accidental death. Nothing has been discovered to suggest changing that at this time,” William McSweeney said. Los Angeles police said in November “substantial new evidence” led them to re-open their investigation into Natalie Wood’s death 30 years ago. The evening before the drowning, Natalie Wood, Robert Wagner and Christopher Walken, who was her co-star in the film “Brainstorm”, had dinner at a restaurant on the island. According to ship Captain Dennis Davern’s sworn statement to detectives, the trio returned to the yacht and had drinks and Robert Wagner and Christopher Walken got into an argument. A furious Robert Wagner shouted: “Do you want to f*** my wife” at Christopher Walken as he smashed a bottle of wine in the moments before Natalie Wood fell overboard, Dennis Davern claimed. The day after Natalie Wood’s body was found off the coast of California, Dennis Davern said he was asked to go to Robert Wagner’s bedroom at his Beverly Hills home, where he met with a lawyer and was told to “Say nothing”. The captain wrote: “Wagner informed me he would hire an attorney who would handle my statement about Natalie Wood’s disappearance and drowning, which he did before Natalie Wood’s funeral. Dennis Davern continued: “Detective Duane Rasure accepted the statement that had been prepared for me – a statement claiming that I did not know details about Natalie Wood’s disappearance from the yacht. Robert Wagner has always maintained Natalie Wood accidentally slipped and drowned as she drunkenly tried to tie up a dinghy against the boat. Police say he is not considered a suspect. 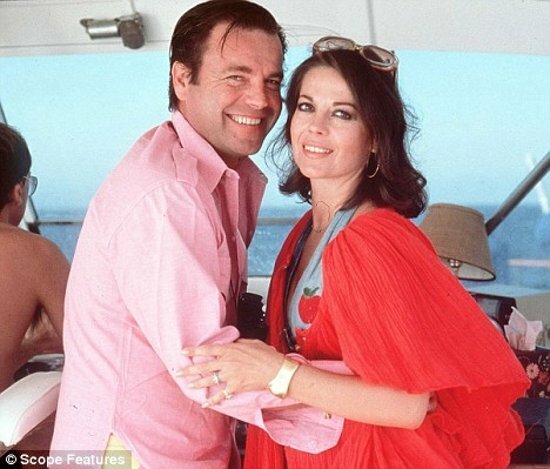 In his memoir, Pieces of My Heart, Robert Wagner explains how he had been on his boat, the Splendour, with Natalie Wood – who he had married twice – and Christopher Walken when an argument broke out. Robert Wagner wrote: “Chris [Walken] began talking about his <<total pursuit of a career>>, which he admitted was more important to him than his personal life. He clearly thought Natalie should live like that, too. As the argument escalated, Natalie Wood left for bed. “The last time I saw my wife she was fixing her hair in the bathroom while I was arguing with Chris,” Robert Wagner said. Robert Wagner described how he and Christopher Walken moved up to the deck as “things were threatening to get physical” and they were calmed by the fresh sea air. Describing his sense of guilt, Robert Wagner continued in his book: “Yes, I blamed myself. If I’d been there, I could have done something. I wasn’t, but ultimately, a man is responsible for his loved one. Lifeguard captain Roger Smith told the Times in November that Natalie Wood could have been saved if officials had been called sooner to search for her. Roger Smith said he was alerted that Natalie Wood was missing at 5:11a.m. the next day. Based on the condition of her body when Natalie Wood was pulled from the water, Roger Smith said he believes she survived for some time in the water and was washed out to sea.